On arrival unwind with a tea, coffee or cool drink and some homemade chocolate cake. Start your day with a beautiful continental breakfast of seasonal fresh fruits, cereal and yogurt followed by locally baked sourdough, cold meat, cheeses and accompaniments. Choose from either the breezeway or screened outdoor room to relax and enjoy your food. Take a stroll to the estuary and beyond or do a workout in the gym at the back of the house. The newly build room has a queen size bed and ensuite. It is detached from the living area of the main house and joined by a breezeway. You’ll have your own TV, free Wifi and tea/coffee making facilities. There is a gym for you to use with entry external from the main home. There are also two outdoor shared living areas for you to enjoy. The breezeway is filled with morning sun and the screened back indoor/outdoor room captures the afternoon sun in winter or the cool sea breeze on a summer morning. The main dining room/kitchen opens onto this area by an expansive glass stacked sliding door. It’s is a great place to dine or socialise with your hosts if so desired. Continental breakfast is included in the tariff or at an additional cost a cooked breakfast can be arranged. As can a home cooked evening meal or a packed picnic lunch. Breakfast is served in either of the two outdoor areas, both just outside your room. Relax and enjoy the sounds of many bird species in the adjoining bush land whilst fueling your body for the day ahead. Entry to your room is via the breezeway where you will have no impact on the main home. The breezeway, screened room and gym are all shared areas with your hosts. Interaction with your hosts is entirely up to you. If you would like some tips on local attractions and amenities we would be more than happy to share our knowledge of the area. If solitude is what you are after we respect that but always available if you need anything. Our aim is to make your Moonee Beach experience a pleasurable one. 3 minute walk is Moonee Beach reserve and estuary with endless water activities to be enjoyed. On high tide you can kayak/canoe or paddle board up the estuary to either fish or explore the wonders of the waterway. Swimming against the tide in the estuary is also a popular form of exercise for many locals. As is an early morning surf at the beach. Alternatively you could go for a walk to the headland in search of whales and dolphins or further beyond along the beautiful beaches to the north and south. This is part of the great Solitary Island Coastal Walk from Sawtell to Arrawarra (60km).There are BBQ’s and a picnic area right on the estuary for you to take full advantage of. Moonee Beach shopping centre is just 5 minute walk with all the amenities you would need, including 3 dining options. In the same complex is a 24/7 gym and soon to be opened indoor swimming pool. Across the car park is the Moonee tavern and bottle shop. 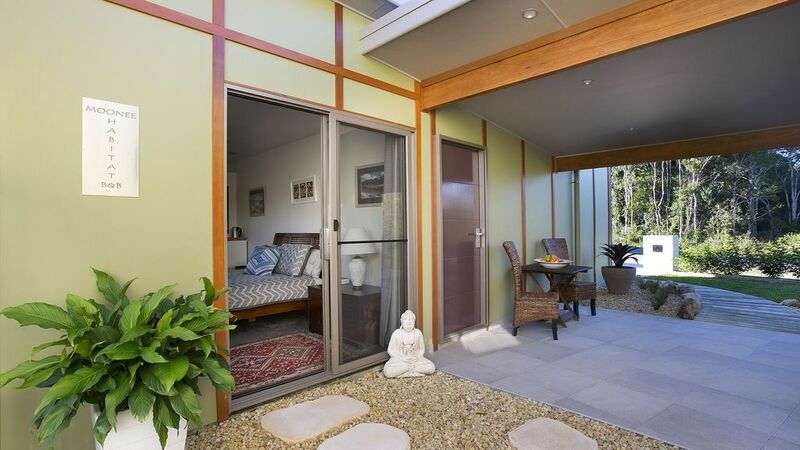 Moonee Habitat BnB is located just off the A1 highway 7 minutes north of Coffs Harbour. Buses run daily to Coffs Harbour and Woolgoolga, there is also a local taxi service. Pick up from the airport can be arranged. If you're a cyclist there are cycle lanes both on the highway and local roads to the north and south of Moonee Beach. As well as many great rides into the hinterland on the western side of the highway. Everything about our stay was really great. Excellent location, very welcoming and helpful hosts. Lovely accommodation with excellent breakfast. Would highly recommend. Thanks Tracey for taking the time to post a review. It was a pleasure meeting you both and we're glad you enjoyed your stay. It would be a pleasure to have you back any time if you're ever up this way again. PS sorry about the error on your cleanliness star rating, of cause I gave you 5 but it didn't register. Having arrived from overseas with limited knowledge of the area Cheryl and Matt could not have done more to make us feel welcome and acquaint us with the local environs. The accommodation was first class and breakfast was awesome. We would definitely recommend a stay. Cheryl & Matt were very lovely people. The accommodation was very well presented and breaky was great. And of course we loved having cuddles with Lily. Would very much recommend to stay at Moonee Habitat Property in a minute. I would happily stay there again. Thank you so much. We had a lovely time and really enjoyed the beautiful homemade breakkie.